We were in the mood for Asian, but we didn't want to go for sushi and we wanted something a bit more sophisticated. 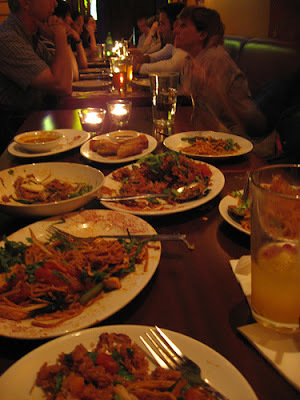 Thus, we headed out to one of my favourite restaurants, Banana Leaf. 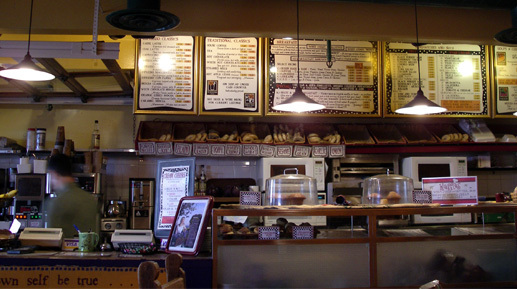 The Denman location is small and cozy but it can get a little tight in there when it is busy (which is often). The room, decorated with Malay sarongs and wooden art, is quite tastefully done. M says: I ordered my favourites: a serving of the Roti Canai appetizer (1 for $3) with the Rendang Beef Curry ($11) with a side of Turmeric Rice ($1.50). Their roti canai is simply the most authentic roti in Vancouver. Granted their version is sweeter and not as good as roti in Malaysia, but it's pretty close and very tasty. Flaky and warm, it's wonderful with its rich, flavourful curry dip. The rendang curry is described on the menu as being a staple of festive occasions. The big chunks of beef cooked in coconut gravy and spices created a very enjoyable curry dish. While T though that the meet was a little dry, I still liked the dish (even though extensive flossing is required after consumption). The rice, flavoured with turmeric was not plain and was a nice surprise. All of this, served with a Tiger beer ($5.50), made for a wonderful trip down memory lane. I left happy, with a smile on my face, nostalgic of my traveling days. T says: I chose the Lamb Satay (4 for $5) and one of the specials, the Braised Duck in Cumin and other spices ($18) with a side of Turmeric Rice. Everything was properly prepared and was very tasteful, although I did find the meat in the beef curry to be a bit on the dry side. Malaysian food is not normally one of my favourites, even in Malaysia. But after eating here, I can see why M likes it so much and I have to say, I did enjoy it quite a lot myself. Pro: The food is always tasty and quite affordable. Con: It's unfortunate that their menu doesn't include the classic Malaysian dish called Hainanese Chicken Rice, which is wonderful when done properly. This is a staple of the diet, available everywhere and always tasty. Malaysia's cuisine is a wonderful mosaic of it's main cultural groups and Banana Leaf would do well by including some of the country's Chinese influences in its menu. Verdict: T says yea, M says yea. Simply the best Malaysian food in the city. We decided to go out for breakfast before hitting Granville Island. We picked Hilary's Caffè Café; it was slightly busy and seemed inviting. Inside, there was no music but the sound of chatter and refrigeration compressors. Thankfully, half-way through our breakfast, the owners did put on music. M says: I ordered the Special, which is a cheddar and herb omelet with herbed country potatoes, bacon and a bagel of my choice. For a drink, I ordered a mint tea. After a 15 minutes wait, our food arrived, but sans bacon. The bacon arrived 5 minutes later. Everything we ordered was cold and overcooked. This is very surprising and unforgivable considering that this is a microwave/toaster-only kitchen. Timing should not be an issue to them - with all the microwaves they have in there it would be easy to time everything correctly so that food arrive quickly to the tables while still hot and perfectly cooked. T says: I ordered the West Coast Mini, which consists of a 1 egg omelet, bacon and a bagel with avocado cream cheese - the flavour was my choice. For the omelet I picked the Ranchero, which has salsa, sour cream, cheddar and green onions. And for a drink, I ordered the White Hot Chocolate. The menu was confusing and did not explain things like what a "platter" consists off. While M ate almost everything on her plate, I hardly ate any of it. From the eggs to the cream cheese, nothing was good. Even my drink tasted like watered-down hot chocolate with a pinch of white chocolate powder. * The total bill for both our breakfast and drinks came to $17.34. Pro: Their price for beer is amazingly good, and they have a wide variety of sandwich on the deli menu. They also have a patio, but it's not heated. Con: This breakfast reminded us of airplane food. In fact, it seemed even worst than airplane food. In the air, at least, your expectations are low and the food it hot. Verdict: T says nay, M says nay. 'Nough said.